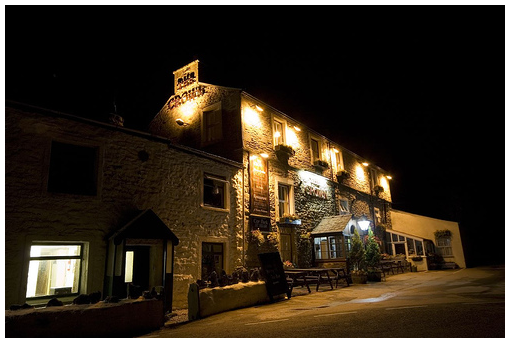 The Yorkshire three peaks challenge is an assent of three of the most prominent hills in the Yorkshire dales. 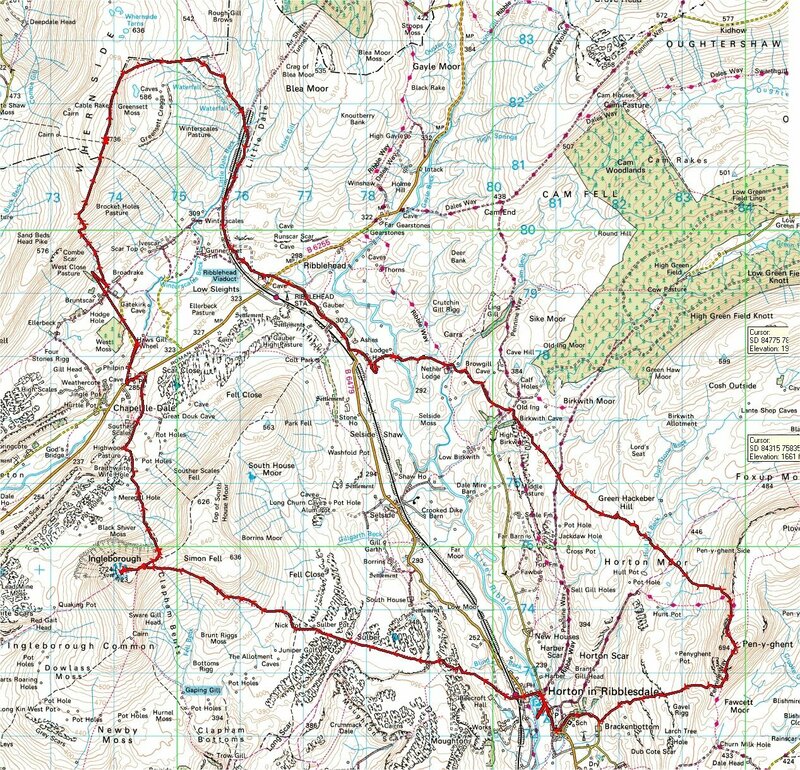 Pen-y-ghent (694m or 2,277 ft), Whernside (736m or 2,415ft) and Ingleborough (723m or 2,372ft). The challenge rules stipulate that the 23 mile route should be completed within the benchmark 12 hours. The challenge was conceived in 1887 by D.R. Smith and J.R. Wynne-Edwards, two schoolmasters of the nearby Giggleswick grammar school, it used to be known as just the “Three Peaks Challenge” but when the national three peaks (Ben Nevis, Scafel Pike and Snowdon) became popular the prefix “Yorkshire” was added to avoid confusion. We had chosen to travel up by train and were made most welcome by Jo and Steve at the Willows B&B who provided useful advice and local knowledge. We woke early (5:45) and after a bacon sandwich and clocking in our start time at the Pen-y-ghent café we set off up the path to the first of the peaks. Just over one hour later and having enjoyed a scramble up the steep final section, we reached the top of Pen-y-ghent. True to its name the wind was blowing fiercely (Pen-y-ghent translates from the ancient Cumbric language as “hill of the wind”) so after a quick photo we decided to descend. 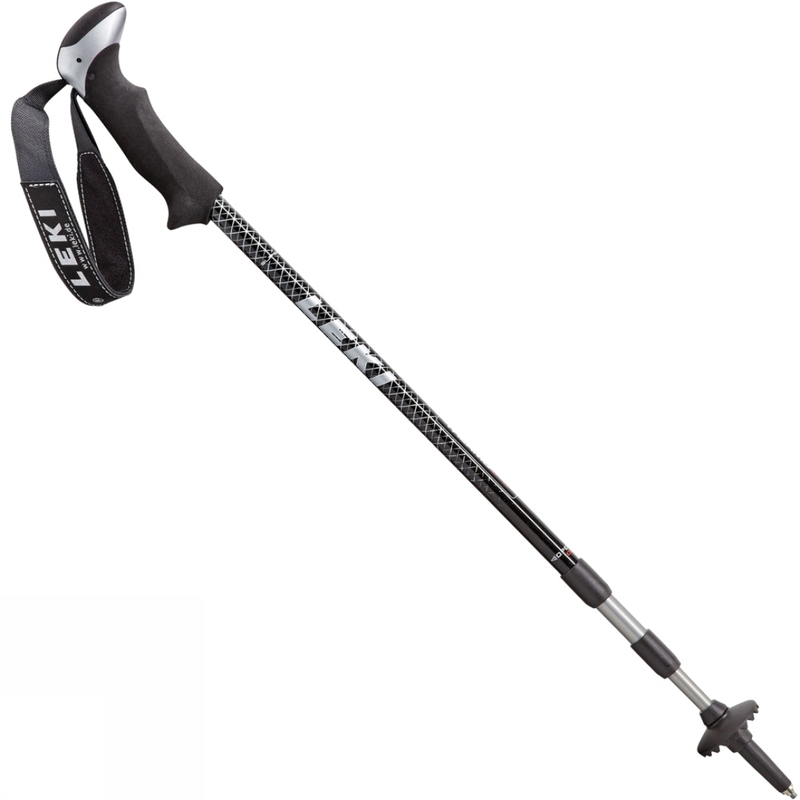 We had been warned of a large bog at the bottom of the hill but the new path was a delight to walk on and I decided to give my new walking poles (recommended Kilimanjaro kit) a test. At first, walking with poles seemed challenging, a bit like walking but with the additional effort of having to lift and move the poles as well. After a couple of miles the rhythm of the poles felt more natural particularly on downhill sections. The walk out to the second peak, Whernside is a long old schlep, about two thirds of the way there the rain set in, from this point on the inclement weather became a notable feature of the walk that would be difficult to ignore. “It wouldn’t be a challenge if it was easy” we rationalized. Despite the rain our spirits were lifted by the impressive view of the Ribble Head Viaduct and a mobile van selling cups of tea. We decided we could afford a 10 minute break and a strong cup of Yorkshire tea. “Is there a bin near by?” I enquired, “There are no bins at all in the national park and I only take my own litter back” was the abrupt response. Once we reached the viaduct we were faced with two choices of route. The more popular route is longer but a good path and even gradient all the way, we decided to take the shorter but extremely steep route straight up to the summit. An hour later we were all utterly demoralised, the combination of boggy ground, high winds, driving rain and the oppressively steep climb was testing our resolve. Trying to remember that it wouldn’t be a challenge if it were easy, we soldiered on to the peak of Whernside. I contemplated taking a photo to mark the achievement of our second peak but decided that I didn’t dare take the camera out of its waterproof case! I could imagine that the walk along the ridge would be a highlight on a nice sunny day but for us the visibility was about 20 meters and the strong side-winds carried hail stones that stung the side of our faces. We descended quickly and once out of the cloud our moods were lifted when joy of joys it briefly stopped raining. Throughout the descent I had tried to be sympathetic to my friends who were grumbling about the discomfort of their wet feet, the truth was that despite having identical boots mine remained dry. The difference? Gaiters. 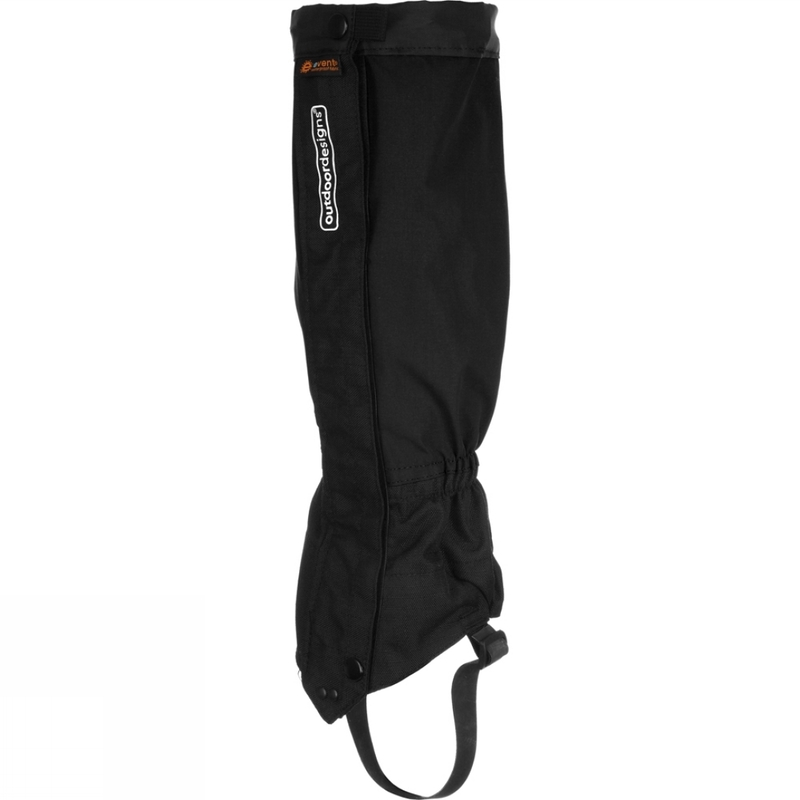 I had purchased a pair of gaiters a few days previously after hearing stories of the Pen-y-gent bog but hadn’t appreciated just how effective they could be in heavy rain. It seems that my friends boots had not leaked but become wet through the ingress of water over the top of the boot. We stopped for 5 minutes to allow excess water to be poured from boots and for socks to be changed. Refreshed we set off on the short trip across the valley to the base of our final peak, Ingleborough. Shortly after starting up the path the rain set in again and the well laid stone track turned into a stream. As the path steepened our hearts pounded and leg muscles ached with each step. We agreed that the steep route up Whernside hadn’t been the best option. The last section of Ingleborough is a scramble up the limestone rocks followed by a more forgiving gradient to the summit. Visibility was extremely poor at the summit and we had to walk close together and note our route back carefully. After the obligatory touching of the trig point we turned straight back round and headed back to Horton-in-Ribblesdale. The walk back seemed painfully long and in particular the finger post sign that stated 1 mile to Horton felt like it had been misplaced, our land-lady later confirmed that it had indeed been re-measured recently. After crossing the limestone pavements and negotiating the flooded boggy ground we hobbled into Horton and logged our time with the Pen-y-ghent café. 11 hours 15 minutes, not a course record but given the conditions we felt proud of our achievement and had 45 minutes to spare to be within the regulation 12 hours. So did I enjoy the challenge? Undoubtedly, I’m sure I would not have attempted these three beautiful Yorkshire hills in one walk were it not for the popularity of the challenge, but there again I think I also understand where Wainright was coming from when he wrote “Some people have chosen to regard the walk as a race, and this is to be greatly regretted, walking is a pleasure to be enjoyed in comfort”. The public bar of the Crown Hotel was packed that Friday night, rammed full with energetic young men talking excitedly about the challenge that lay ahead of them, amongst them sat three broken men nursing pints of Black Sheep, lacking the energy to engage in conversation but quietly proud of their achievement. 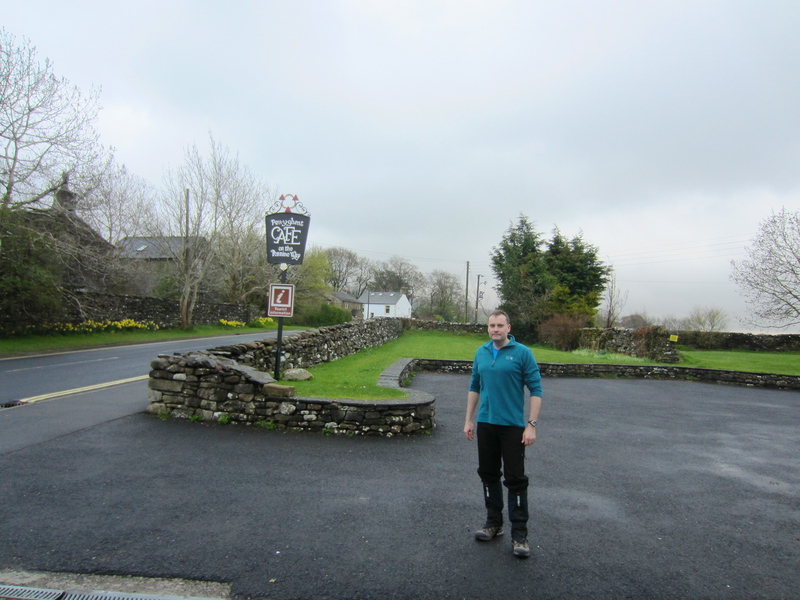 This entry was posted in Uncategorized and tagged 3 peaks, Gaiters, Horton, Horton in Ribblesdale, Ingleborough, Pen-y-ghent, three peaks, Walking Poles, Whernside, yorkshire 3 peaks, yorkshire three peaks on May 11, 2013 by yateschr.